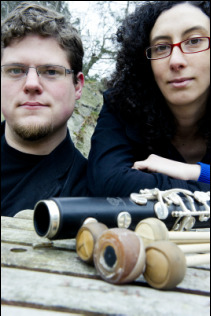 Praised by the Boston Globe as "superb", Transient Canvas (Amy Advocat, bass clarinet & Matt Sharrock, marimba) has been blazing its own trail in the world of contemporary music since 2011. 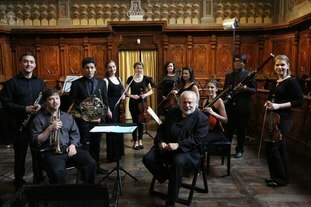 In under five years, they have premiered over sixty (60) new works, essentially creating an entirely new repertoire for their unique instrumentation. Fearless in their programming and hungry for new collaborations, Transient Canvas has performed anywhere from microbreweries to Jordan Hall and actively seeks out new composers to stretch their instrumentation to its limits. Dedicated to spreading their repertoire, the duo has performed across the United States. Past seasons include featured performances at the first annual New Music Gathering in San Francisco, the Firehouse New Music Series in Brooklyn, and the Goat Farm Arts Center in Atlanta. Their 2015-16 season includes concerts and masterclasses at colleges and universities in Georgia, Illinois, Maine, Maryland, Massachusetts, North Carolina, Ohio, Virginia, and Wisconsin in addition to a residency with the San Francisco-based Guerrilla Composers Guild. In their hometown of Boston, they have been featured performers with the Equilibrium, New Gallery, Opensound, and Original Gravity Concert Series. 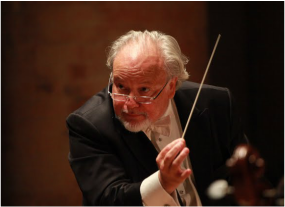 Jeffrey Silberschlag is music director and conductor of the Chesapeake Orchestra and River Concert Series, and serves as artistic director and head of music performance at St. Mary's College of Maryland where he is the Steven Muller Distinguished Professor in the Arts. 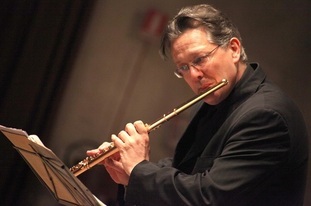 He has appeared as guest conductor with the London Symphony Orchestra, London Philharmonic, St. Petersburg Soloists, Orchestra Filharmonici di Torino, Symphony Orchestra of Rumania, Bulgarian Philharmonic, La Scala Virtuosi, Prague Chamber Orchestra, Salzburg Chamber Orchestra, and the Moscow Academy Chamber Orchestra. He also collaborated which such soloists Anne Akiko Myers, Mikhail Gantwarg, Hilary Hahn, Yi Jia Hou, and Lara St. John (violinists). In 2011 he received the Prize for Artistic and Cultural Activities from European Union of the Arts for his lifetime achievement in classical music as a conductor and trumpeter. Mr. Silberschlag is also a prominent trumpet performer on the international music circuit and has recorded as trumpet soloist with the London Symphony Orchestra, Royal Liverpool Philharmonic, Seattle Symphony, Czech Radio Orchestra, Warsaw Philharmonic, and the Maryland Bach Aria Group. He held principal trumpet positions with the Italian National Symphony RAI-Torino; Jerusalem Symphony; and the New York City Opera-National Company.